I admit it... I love stripes! I also love self-striping yarn. 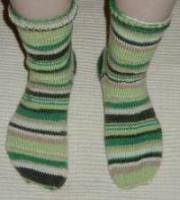 These socks were made using Regia's new 6-ply Crazy Colors yarn and their sock pattern from Inspiration magazine #59.